This is an excellent example that illustrates multiple welds performed sequentially to create a reliable leak proof pressure tight fluid vessel. 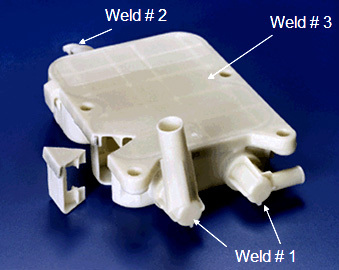 Weld #1 consists of attachment of the inlet and outlet connector elbows in a common cycle - note that the orientation can be model specific and accommodated within the Emabond weld fixture. Weld #3 completes the vessel by welding the back cover to the previously prepared sub-assembly. Weld steps 1, 2 and 3 are performed sequentially using separate welding stations. 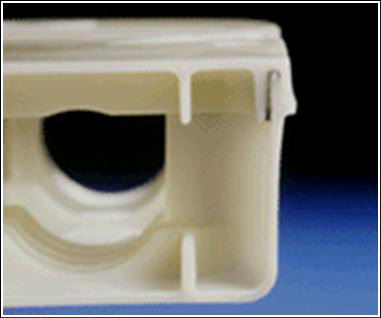 Alternatively interchangeable fixtures can be specified to allow for batch welding using a single welding station.